The 8th Annual Medical Anthropology Young Scholars (MAYS) Annual Meeting “Medical Anthropology Beyond Medical Borders” was held at the University of Edinburgh, Scotland on the 15th and 16th of June, 2017. The conference was organised by Lilian Kennedy (University of Edinburgh) and Mari Lo Bosco (ICS-ULisbon), and in collaboration with SoMA (Students of Medical Anthropology), of the University of Edinburgh. In thanks to a generous grant from EASA, we were able to organised travel scholarships for five participants, and SoMA sponsored accommodation scholarships for four participants. During the two-day meeting, 25 participants from countries around the world, presented their work in three different parallel groups. This allowed participants to exchange feedback on each other’s work in a peer-review format. These parallel groups were organised by the themes: working with medical professionals and medical students, public dissemination of research, and research on biomedical research. As in the previous annual meetings, the program consisted of keynote lectures, parallel sessions and workshops. The MAYS meeting was commenced by a welcome speech by Ian Harper, Chair of the EdCMA (Edinburgh Centre for Medical Anthropology) and Professor of Anthropology at the University of Edinburgh. The keynote speech, entitled Who Gets Hijacked? : Navigating Collaborative Medical Anthropology Research in Nigeria, was given by Daniel Jordan Smith, Chair of Anthropology at Brown University. The Keynote speech was opened to a broader public of students, PhD candidates, and postdoctoral researchers in Anthropology and health-related fields across the University. Since the theme of this conference ‘Medical Anthropology Beyond Academic Borders” addressed both the current academic work of participants, as well the issue of making this work application to the world beyond academia, this conference also had workshops with addressed both these academic and practical themes. Seven different workshops were organised, across the two days. Daniel Jordan Smith, Chair of Anthropology at Brown University, who spoke on building an academic career in Medical Anthropology. Neil Thin, Senior Lecturer at the University of Edinburgh, who spoke on MOOQs. Alex Edmonds, Professor of Anthropology at the University of Edinburgh, who spoke on writing on journalistic platforms. Laura Cockburn, from the Knowledge and Exchange department within the Social and Political Science at the University of Edinburgh, who was meant to speak on how to present the impact of one’s research in grant applications. Unfortunately she got sick the day before and could not attend. Anne Jepson, Senior Researcher within SPiCE, led a workshop on her career trajectory and her current responsibilities as researcher for the Scottish Parliament. Joseph Long, Research Manager at Scottish Autism, led a workshop on his current responsibilities as Research Manager, and how to market your academic career to the non-profit sector. Kelly Sheill-Davis, Research Manager at MacMillan Cancer, was scheduled to led a workshop on her career trajectory and current job responsibilities, however also fell ill and was unable to attend. For many participants, the MAYS annual meeting provided a first opportunity to present their work to peers in a constructive and friendly atmosphere. The discussions in the parallel group sessions and workshops were lively, and covered both feedback on students’ work as well as debate about how to best make anthropology’s findings and methods applicable to wider audiences. The conference dinner was well attended by both students and workshop leaders and allowed for these discussions to continue in a relaxed environment. Many of the feedback forms from the event remarked on the helpfulness of discussion about post-PhD research careers and the friendliness and sense of community at the event. In August 2016, Mari Lo Bosco stepped down as coordinator. Elections were held in July, in which all MAYS members were invited to vote for one of five candidates, using an online form. Possible candidates applied for the position by sending in their CV and a statement describing their plans as MAYS coordinator, if they were to serve a two-year term. Erica Niebauer (Universität Heidelberg) was elected as a new coordinator and Lilian Kennedy continue as coordinator until 2018. The aim, as in previous years, is to have coordinators serve two-year terms, with new coordinators being elected each year. This way, a more senior coordinator who has already planned a MAYS annual meeting will be on hand to help the new coordinator as they take the lead planning the next MAYS conference at their institution. The 7th Medical Anthropology Young Scholars (MAYS) Annual Meeting “Intergenerations, temporalities and medical anthropology” took place at the Institute of Social Sciences of the University of Lisbon (ICS-ULisboa) on the 23rd and 24th June of 2016. The conference was organized by Mari Lo Bosco (ICS-ULisboa) and Natashe Lemos Dekker (University of Amsterdam). During the two-days meeting, 20 participants from different countries presented their work in 3 parallel groups. This allowed them to exchange thoughts on each other’s work in a peer-review format. As in the previous annual meetings, the program consisted of key note lectures, parallel sessions and workshops. The opening lecture Temporalities and generations of treatment, containment and prevention: the case of sexually transmitted infections was given by Prof Cristiana Bastos from the ICS-ULisboa and Prof Arthur Kleinman from Harvard University delivered the keynote lecture titled Medical Anthropology and Medical Humanities at Harvard University. Its history, present and future of teaching and research. We decided to open the lectures to a broader audience interested in Medical Anthropology. A broader public of students, PhD candidates, and postdoctoral researchers in Medical Anthropology attended both lectures, which are also available online on the ICS’s YouTube channel for future consultation. Since the general topic of “Temporalities and Intergenerations” addressed both theoretical and methodological issues within the field of medical anthropology we organized two different kind of workshops. A more practical workshop called Tips and Tricks for Academic Writing was given by Elizabeth Challinor, research assistant from the University of Minho (Portugal) and a second workshop - How to experience temporality, methodological questions – focused on the theoretical approach was delivered by Simone Frangella, a post-doc researcher at ICS-ULisboa during the second day of the conference. For several participants, the MAYS annual meeting provided a first opportunity to present their work to peers in a constructive and friendly atmosphere. Overall, it proved to be a good place and platform for young scholars to meet and share their own research interests and findings. In August 2016 Natashe Lemos Dekker stepped down as coordinator. Elections were held upon which all members could vote by e-mail. Possible candidates could put themselves forward by sending a biography and statement how they envision MAYS and what they would do to bring MAYS forward. Lilian Kennedy (University of Edinburgh) was elected as a new coordinator and Mari Lo Bosco will stay as coordinator until 2017. The aim is to alternate each year between having one coordinator who has already organized a MAYS annual meeting and a new coordinator, so that former experiences can be passed on. The MAYS 2017 meeting is currently being planned. It will be hosted by the EDcMA, the Edinburgh Centre for Medical Anthropology, in collaboration with SoMA (the Student group or Medical Anthropology), and will take place on 15-16 June 2017. 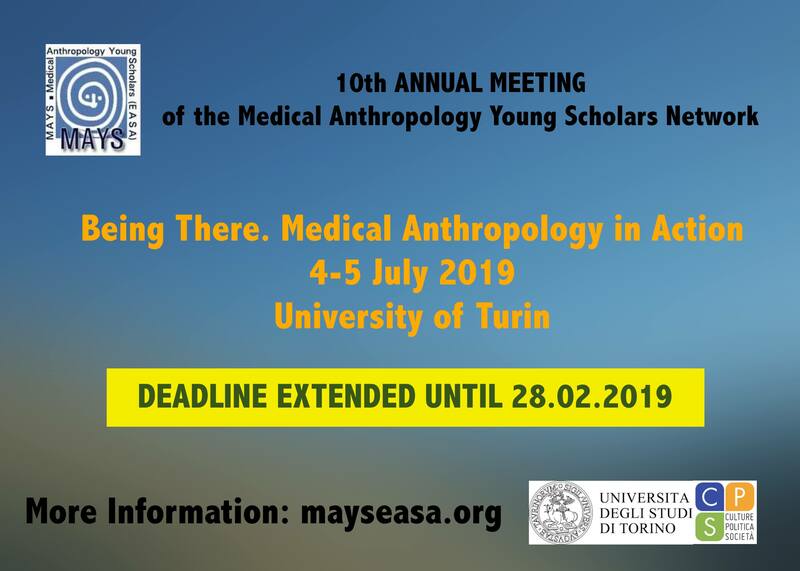 This is an initiative of the EASA medical anthropology network. Mobile Medical Anthropology offers an opportunity for post-docs and senior teaching staff to move within our network to another University of their choice and exchange ideas with the lecturers and students there through participation in research seminars. The aim of the initiative is to learn about different styles of teaching, learning and doing medical anthropology and to compose a joint publication.